After many years of hard labor, Don Carter State Park was born in 2013. First conceived by Mr. Don Carter himself, the State of Georgia delivered the park to us without fanfare or complications. Now, it’s hard to remember the time before our idyllic park came to life. 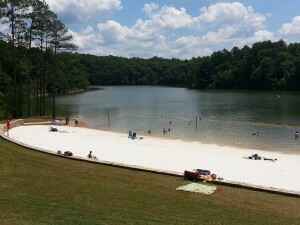 This recreation area on Lake Lanier is in a rather remote location on the banks of the Chattahoochee River, north of Gainesville, near Clermont, GA.
Burger joints, gas stations and food markets are within ten miles, but not around the corner. If that’s bad news, maybe you’d rather camp in Atlanta at the Ritz? You can snag a suite (with a grand piano) for a few hundred dollars a night. Just don’t walk around outside in Atlanta after dark. Ditch The Big City and head for the country! Hitch up your camper and escape to Don Carter for a while. Or, pitch a tent in the woods with the crickets and let the sound of the wind put you to sleep. Just get off the sofa and get out of the house. You’ll live longer. You’ll also meet some of the world’s nicest people: campers! After a few days, you’ll wonder why anyone goes to Atlanta, except to watch the Braves or Falcons win a game, or to fly somewhere else. Wondering where to hold your next family reunion? Rent a cabin at Don Carter State Park. Just bring your family and your food. Everything else is provided. Everyone will love it. Can’t rest without the noise of a bustling city? Bring a recording of car alarms, gunshots and sirens with you. Or get used to an occasional owl hooting you to sleep. While on the Hawaiian island of Molokai, I once saw one of the world’s most exquisite white-sand beaches. Save yourself a gajillion dollars in airfare. Romp in the sand at Don Carter Park’s beach. It’s just as pretty and it’s easier to drive to Don Carter State Park in your motor home than it is to drive to Hawaii. My favorite fishing holes are along the rock-lined edges of the Chattahoochee River near Don Carter. You never known when you’ll get a hit. It’s what fishing is all about. If you land a few, you’ll appreciate the fish cleaning station that awaits your victory celebration back on land. Don’t have a boat? Pffft. No problem. 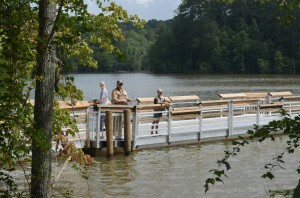 There’s a family-friendly fishing pier near the boat ramps. The park’s delightful two-bedroom cabins have lake views, rocking chair porches and individual grills. Make memories and dinner. Just bring food, charcoal and an appetite. My Niece will be working at Don Carter State park. So proud of you Lori.